Making meatloaf in the Air Fryer became a game changer for us. Now you can make delicious moist meatloaf in less time in your Air Fryer. We are still on the Air Fryer bandwagon in our home and it’s not going to stop anytime soon. Fact is, it has made our lives so much easier when it comes to getting dinner on the table in a hurry. Since both my hubby and I work full time and have a ton of side projects, we just don’t have much time to devote to meals that take a long time to cook. That’s where this Air Fryer Meatloaf comes into play. Meatloaf is one of my comfort foods but it typically takes me almost a good 90 minutes to bake a 2lb meatloaf in my oven, unless I’m making my Mini Mozzarella Stuffed Meatloaf in the oven. But for a huge loaf, the Air Fryer allows me to cut that time almost in half. Thanks Air Fryer! Making meatloaf in your Air Fryer is easy peasy. 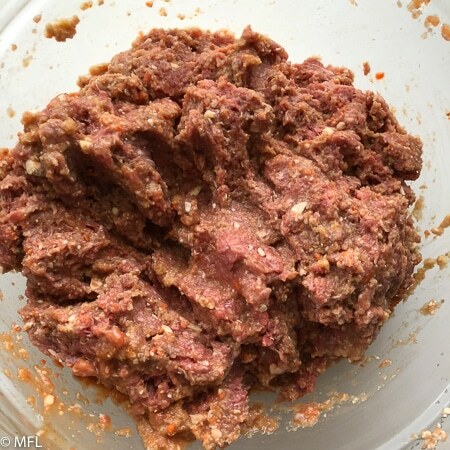 You will use whatever meatloaf recipe you like (my meatloaf recipe is included below) and “fry” it in your Air fryer at 390-400 degrees Fahrenheit. How long will depend on how much meat you put in your loaf. For a 1lb meat loaf, cook for about 25-30 minutes. For a 2 lbs of meat, go up to about 45 minutes. I like to combine my loaf made of meat and place it directly in the Air Fryer basket or on my Phillips brand grill tray. This grill tray didn’t come with my Phillips Air Fryer so I had to purchase it seperatley. I find it handier than the basket and easier to clean. 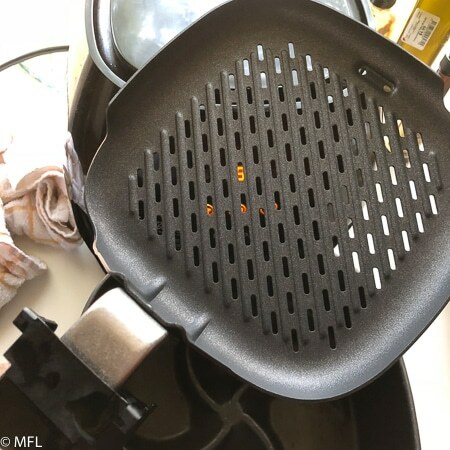 No worries, if you don’t have the grill tray for your air fryer, you can still place your meatloaf in the basket. I do however recommend using foil paper or these parchment paper rounds for the bottom of your meatloaf so it’s easier to remove and doesn’t leave a humongous mess. Once the recommended time on your meatloaf is done, use a quick read thermometer to check the temperature. Ground beef should reach a temperature of 165 degrees Fahrenheit. 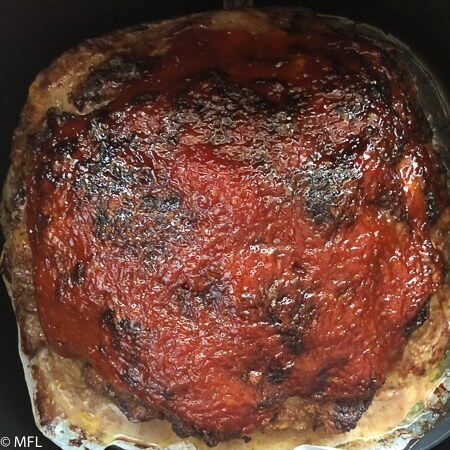 Meatloaf in an Air Fryer vs. Oven, What’s the Difference? Time. That’s pretty much it. As far as texture and taste, it’s the same. But the time saved making a meatloaf in the Air Fryer is worth taking the time to put it in the Air Fryer. The Air Fryer preheats much quicker than the oven and the time it takes to get done is much quicker. Whatever kind your heart desires. Beef, turkey, pork, a combinaition…they all will work in your Air Fryer. 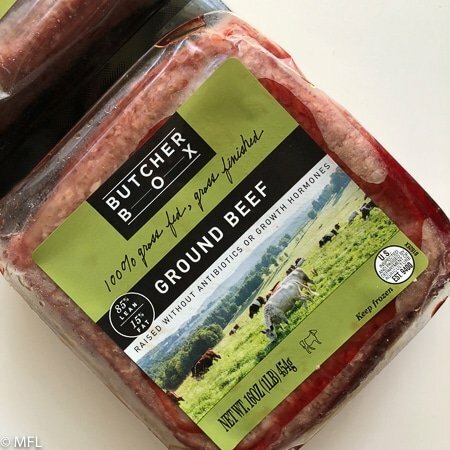 I’m still working on my first shipment of meat delivered to my door from ButcherBox (You can see my unboxing of my first box of meat on Facebook) and used the grass fed beef to make this meatloaf.) It was delicious! 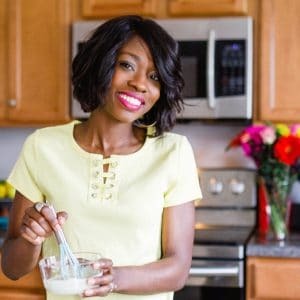 Want to know what people are saying about my recipes? Check out this video or check out the comment section on each post. Making meatloaf in the Air Fryer became a game changer for us. 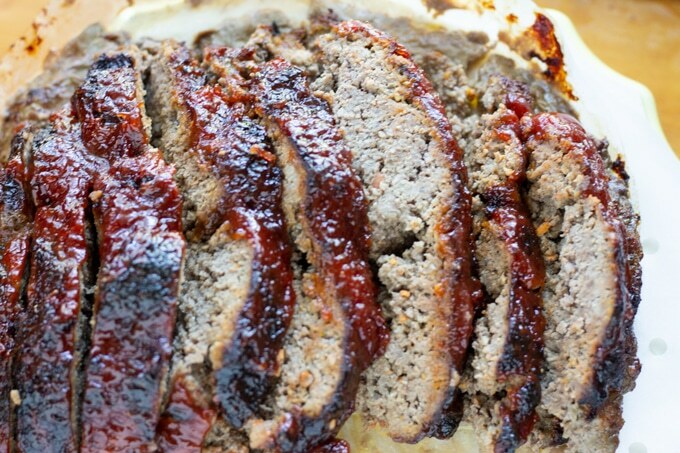 Make delicious moist meatloaf in less time in your Air Fryer. 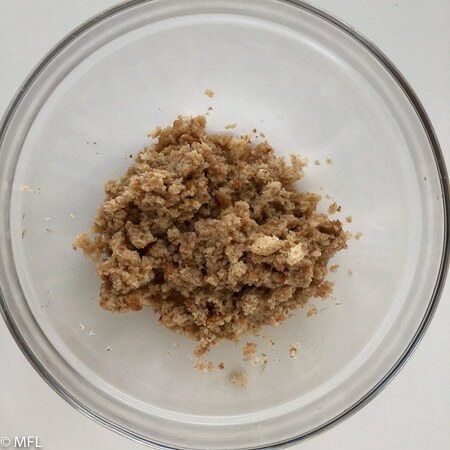 Add breadcrumbs and beef broth to a small bowl and stir until breadcrumbs are coated. Set aside. Add mushrooms, carrots, onions, and garlic and process until finely chopped. Place in large bowl. Add ground beef, soaked breadcrumbs, ketchup, Dijon style mustard, Worcestershire sauce, and salt to large bowl. Mix with hands until incorporated. Form into a loaf. 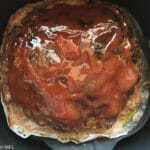 Place Meatloaf in Air Fryer and cook for 40-45 minutes. 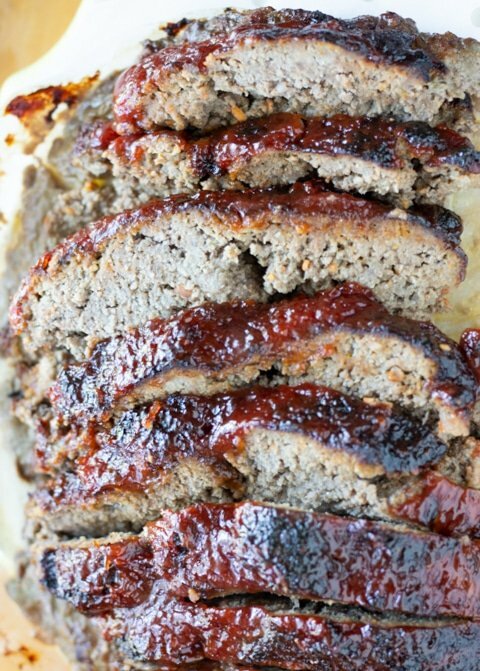 While meatloaf is cooking, prepare glaze by combining ketchup, brown sugar, and dijon mustard. When there is about 5 minutes left on your timer, spread glaze over meatloaf in Air Fryer. Remove and allow meatloaf to rest for 10 minutes before slicing. Most Air Fryers have a maximum temperature setting of 400. The Phillips brand has a maximum temperature of 390 degrees. I love using fresh breadcrumbs in this recipe. I take about 4 slices of whatever bread we have around the house, toss 'em in the food processor for about 1 cup of breadcrumbs. Adding vegetables to your meatloaf helps keep it moist and not dense. Wait a few minutes before slicing your meatloaf if you don’t want it to fall apart. Check on your meatloaf periodically. If it starts to get too brown during the cooking process, cover with foil until it's time to add the glaze. 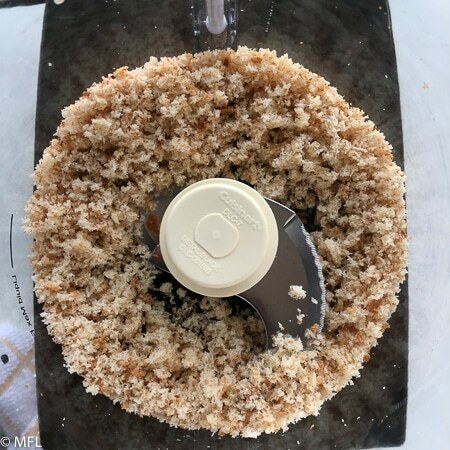 I like to start by making my breadcrumbs fresh in my food processor. Place breadcrumbs and beef broth in small bowl. Set aside. 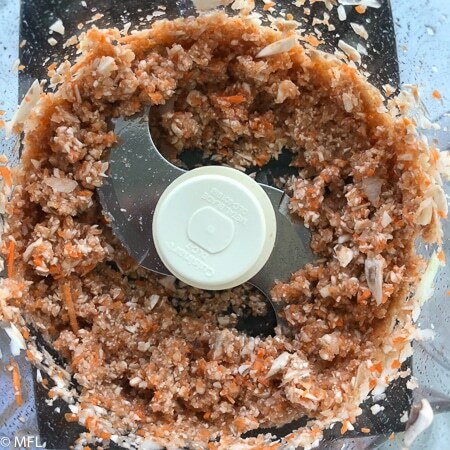 Chop your mushrooms, onions, carrots, and garlic in a food processor. Add chopped vegetables, ground beef, eggs, ketchup, dijon mustard, Worcestershire sauce, breadcrumbs and salt to a large bowl. Use hands to combine. 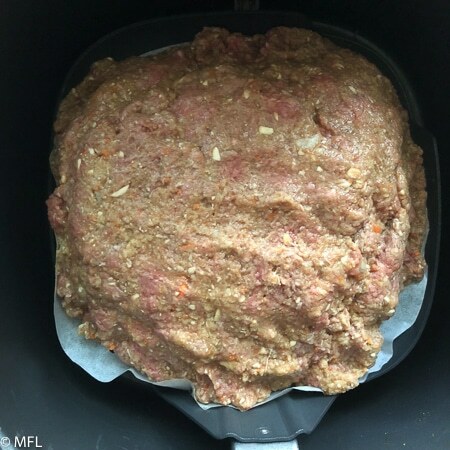 Place meatloaf in preheated 390 degree Air Fryer. 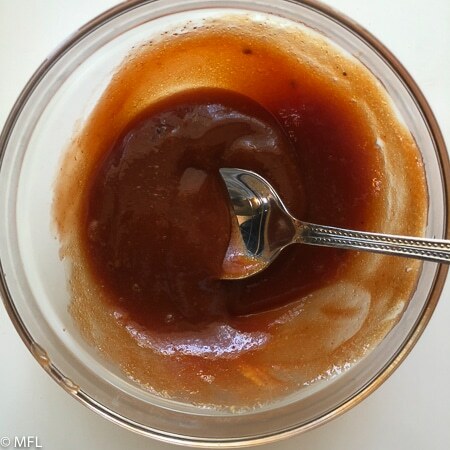 While Air Fryer is frying, make glaze. With about 5 minute cooktime left, cover meatloaf with glaze. Return to Air fryer and cook for 5 more minutes or until meatloaf reaches 165 degrees Fahrenheit. All done. Remove from Air Fryer and allow to cool for 10 minutes before slicing. 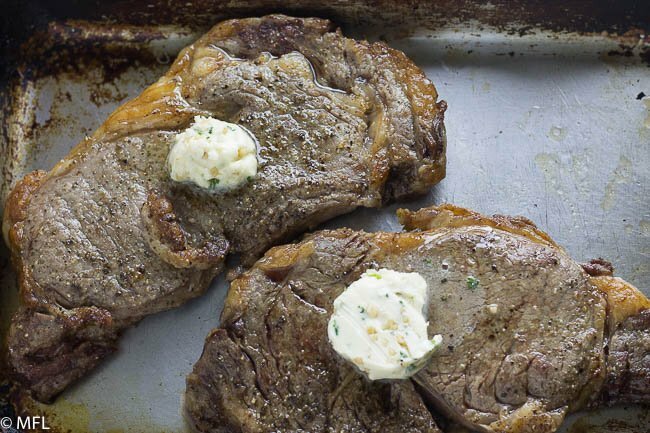 Have you tried my Perfect Air Fryer Steak yet? Hi Jennifer? Are you referring to an Air Fryer oven that has multiple trays? My recipes can be used in those kinds of air Fryer ovens. I do not like meatloaf but I made about 2.5 lb of this recipe for my husband. He loved it. I had to cook it a little longer (probably because there was more meat). I also would have appreciated if the directions said how to secure the tinfoil on top so that it doesn’t blow around. Thanks! I tried this last night and it was wonderful! I love the crunchy top. I changed a few things though. Instead of the soft breadcrumbs, I used Panko bread crumbs (at least a cup, probably more to get the right consistency) I omitted the beef broth and used canned mushrooms because I didn’t have fresh. I placed the loaf on 2 pieces of bread to soak the grease and I flipped it half way through. I also added 5-10 minutes onto the total time. I’m going to try this today. I’ve read it a few times and both the written and written video version never actually say mix the soaked bread crumbs into the meat mixture 😊. Thank you for the info. Hi Rochelle, with 2lbs of meat the meat should have been done with 40 minutes of cook time. However, different brands of air fryers may take longer a little bit longer of a cook time. I use the Phillips Avance XL which tends to be pretty powerful. I’d suggest covering the meatloaf with foil (making sure the foil is secure and not touching the top of the air fryer, you don’t want it flying around or touching the heating element) and not taking the foil off until it’s time to add the glaze. This is the best meatloaf recipe I have ever found. We did not put mushrooms or carrots in ours but everything else we kept the same and it came out amazing! The glaze is absolutely fantastic! We love our air fryer and cook in it often. It is so easy to make meatloaf in there. This recipe is a keeper. Thank you kim 🙂 So glad you enjoyed the recipe. The Air Fryer is a game changer for sure. This is a great recipe, so perfectly cooked! This recipe makes me want to buy an air fryer! This is such a helpful idea! Looks amazing! Thank you for sharing.